Goody is a new shopping app. All Goodys cost under US$10 and ship for free worldwide. Check out Goody today! Would you recommend Goody to a friend? Beautiful app. Super easy to use. Apple Pay and Android Pay work smoothly. Should provide more than just Facebook signin. Some more categories would be nice too. We've been using this app on our Android phones and iPhones for testing and didn't have any problem with it. Discovering new products was easy and we even received some "recommended goody" notifications that were very relevant. Really great to discover new stuff. I even got it on my personal phone now. Think, I'll order stuff there from time to time. BlackBerryInsight has used this product for one week. Easy to use. Good products. Free shipping. It's a great looking app and one of the few that looks very good on the iPhone X. That's quite nice. App Stalker has used this product for one day. It's just a dropshipping app. You just fetch the aliexpress api and add +250-300% to the price. I call that a scam, you don't add any value you just play the middlemen. And a sponge holder with a starting price at 35€ :') . Even your fake promo algo is bad. @hotgeart So they source a product and add a markup to make a profit? I think that’s called a “business”. Cliff Dailey@cliffdailey · I make things. @hotgeart Thanks for letting us all know how business works -- all while trying to criticize and discredit someone's product. If you don't mind me asking, what have you built lately? @hotgeart Thanks for calling this out. Rentier products, while businesses, aren’t interesting or worthy of praise. Why FB sign in? Are you not aware that you alienate a huge portion of potential customers with this restriction? @mickc79 You are right. The Facebook sign-in is a bit of a bummer on iPhone. On Android devices sign-in can actually be done with your Google account. We're not there on iPhone yet, but thanks a lot for your feedback. We'll add more login options soon. Most importantly, we will allow to sign just with any email address. Would that work for you? @kozen23 still not better. Email signup should be there. @josef_moser Please check my second to last sentence: "Most importantly, we will allow to sign just with any email address." That was what you were referring to, correct? @kozen23 yeah, I think tech people need to be aware that then majority of the world don’t have a Facebook account and probably not a google account either. Product hunt actually suffers the same problem. I’ve been coming here pretty much from when it launched but didn’t create an account and start engaging until they opened up angel list login. I don’t use social media. Thanks for hunting, @kozen23! How do you find and curate these products? @amrith We actually curate them by hand. So we look at the quality of the product, the seller's reputation, their speed of shipment and other factors. It's all to ensure that our customers receive only Goodys of a good standard of quality. 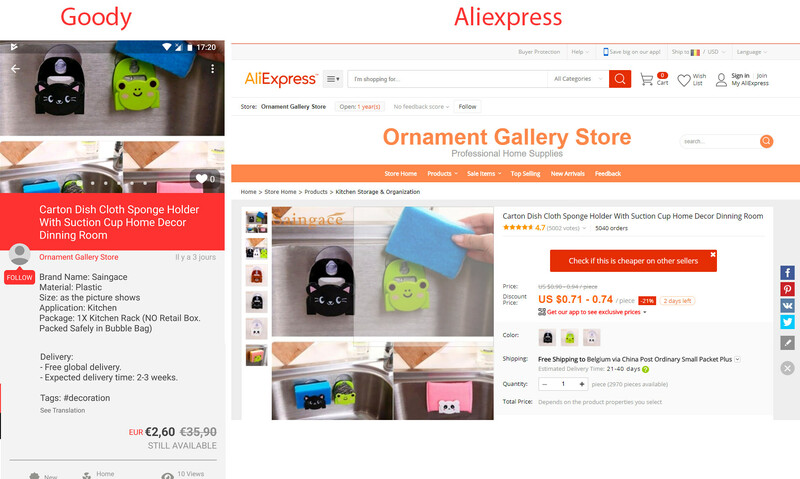 @faisal_hassanx Some of our sellers also sell their products on other platforms like Aliexpress for example. We do not have exclusive contracts with those sellers, but we ensure only reputable sellers with quality products make it onto Goody. This is brilliant. Going to be trying it out. The products aren't available in India? @shashwatpradhan Yes, actually. We've got a little supply or better shipment issue with shipments to India. We hope we can add that back soon :) Stay tuned. @shashwatpradhan noticed the same. Wish this changes soon. Rotate is a weekly rotation of beautiful products. Amazing products, all available on Amazon. Hand-picked products, deals, and ways to save money.